Part of my responsibilities as a Grosvenor Teacher Fellow, besides engaging in learning with my students in our own classroom, is to participate in outreach activities in the broader community. This is an ongoing process that I’m sure will continue for much of the rest of the year, but it is fun to share this with you so far. The most exciting parts, for me, have been sharing my learning with other children. I’ve been giving presentations at local schools, video chatting with classes that are too far for me to travel to, running drop-in presentations at local libraries, and most recently I gave an Earth Day presentation to my entire school (!) to share how the environmental actions we take in our hometown can have an impact even in faraway places like Antarctica. Kids are always my biggest cheerleaders and show such unending curiosity about Antarctica that I always have to cut our Q&A sessions short. I’ve also started sharing my learning with other educators. I was honoured to present at my school board’s first annual STEM conference about the Antarctic measurement curriculum I’ve engaged in with my students. 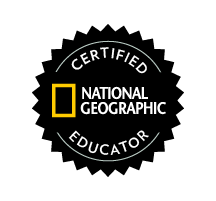 (This same learning was also shared on the National Geographic Educator Spotlight Blog.) Wow those whales are big! My experience has also been shared on the TDSB blog, the Queen’s University International Centre blog, and was showcased in a photography exhibit with my fellow Fellows at the National Center for Nature Photography in Toledo, Ohio. Being a Grosvenor Teacher Fellow has opened up so many doors for me, and there are lots of exciting potential opportunities coming up for me in the next little while. I’ll be sure to write about them in future posts! In the mean time, if you’re interested in having me give a presentation to your group, please feel free to contact me!